…and the ULTRAMATIC DYNAMICS home page. 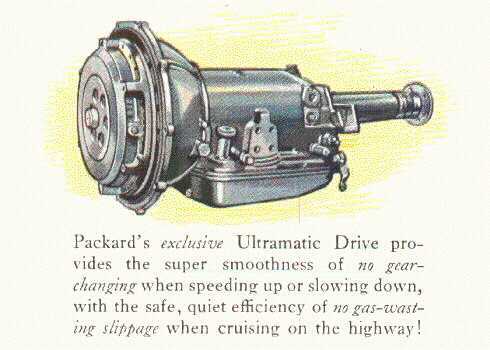 ßInfo—Pics—FAQ’s or “Text the Man Who Rebuilds Them"
This page is dedicated to the restoration of the Packard automatic transmission known as Ultramatic, Gear-Start, and Twin Ultramatic. These automatics were available on most models in the early to mid 50's. I rebuild these units and offer parts, my help, and services to Packard, Studebaker, Nash, and Hudson owners worldwide. I can assist persons in the USA mid-Atlantic area and prefer not to ship transmissions, but will if it’s the only practical way. I have parts to help the hobbyist doing it themselves or assisting a local garage. I generally have fully tested units for 1950-1954 Straight Eights, and 1955-56 V8's, Seniors and Juniors, push button or manual. My 2015 price to remove, rebuild or exchange these transmissions and torque converter is $3700. Exchange only by freight or drop-off $2900.